A pulse could indicate you are alive but in this region it’s a crop that could be called the lifeblood of the industry and a good percentage of the export market. “In 2015, Canada exported six million tons of pulses worth nearly $4.2 billion,” says Pulse Canada on its website. “This is the very best place to grow lentils, lots of sunshine plus heat,” says Cory Nelson farmer near Burdett who grew 1,000 acres of lentils last year. Canadian farmers grew four or five million acres of lentils last year exported to India mainly and also to Turkey. An excellent source of protein, fiber, and iron, lentils are served in soup and curries to mention only two. According to Pulse Canada 38.5 per cent of the world’s lentil production in 2010 was supplied by Canada. 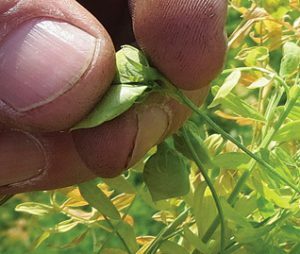 Lentils are planted mid April to early May and harvested in early August, explains Nelson. The crop is generally not irrigated. The world price is really good and it has meant a significant expansion of pulse crops in the last 10 years. Canadian production of the eight major pulse crops such as pea, lentil, bean, chickpea, mustard, sunflower, canary seed and buckwheat, increased from about 1 million tons in the early 1990s to 5.9 million tons in 2015, more than a fivefold increase in 25 years. according to Pulse Canada’s website. Canada is a top five exporter of both dry beans and chickpeas. Over the past 25 years, Canada has emerged as the world’s largest exporter of lentils and peas, and one of the world’s top five exporters of beans. Nelson looks out over several lush crops of beans near Grassy Lake. Yellow beans and pinto beans are supplied to the southern U.S. and if you have ever enjoyed Mexican food, and particularly refried beans, you know exactly how they taste. Beans are generally planted last two weeks of May and harvested mid August and into September, says Nelson. Bean crops are often irrigated. If you notice fields already harvested/swathed and the crop lying in neat rows it may be one of the bean crops. They lay on the surface for a couple of days and up to a week before a combine separates the plant material from the beans. Between 40,000 and 50,000 acres of beans are grown in Alberta. “We have some of the best farmers and productive land in this region,” said Nelson. In the early 1950s, irrigation was extended to the Bow Island area and in 1982 a completely automated distribution system was installed by the St. Mary River Irrigation District (SMRID) serving an area of 5,000 acres, according to Wikipedia. If you are a fan of hummus, a dip or spread made from chickpeas with olive oil, lemon juice, salt and garlic, you’ll be pleased to know many farmers in this region grow chickpeas. “There’s a really big market, we are small players,” says Nelson, while at the same time pointing out the crop is generally not irrigated, and the recent heat has been hard on this year’s plants. A close-up reveals a lentil inside its pod. Canada ready to make a deal on NAFTA?